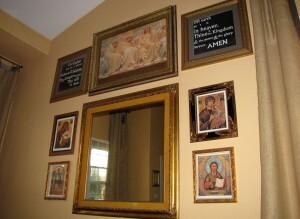 Dave and I picked up some cathedral prints in these 27″ square, very traditional frames from a hotel liquidator’s store. They were nice enough and fit with my “sanctuary” art, but I had an idea. 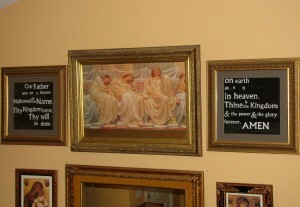 I have wanted to have a part of the Lord’s Prayer in my living room/sanctuary since I moved in. I have really come to understand and appreciate the beauty of how Jesus taught us to pray and am bowled over by the simple power of the words “on earth – as it is – in heaven.” I sometimes wonder if I should quit praying anything else but “The Lord’s Prayer” until I really get it, that it is THE prayer. So, I watered down some black acrylic to give it more of an “inky” consistency and just sort of wiped it over the prints in a pretty casual manner. 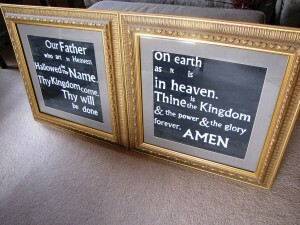 Because I am hanging them near my religious iconic art (which are really pretty primitive), I figured the sort of “folk-style” lettering would work well. I traced the lettering on using graphite paper (from a Publisher document I’d made) and then just painted the letters with quick swipes, not worrying about coverage or staying in the lines. I wish I’d been more courageous and made my letters bigger and bolder. As is, I probably could have had the entire prayer, but I was afraid it wasn’t all going to fit. I had been thinking about painting or replacing the mats, which were very faded, but after they were done, they seemed right. On earth. As it is. In heaven.